A woman in Klamath Falls was hospitalized late Tuesday afternoon after she was attacked by two dogs. The incident happened shortly after 5:00 p.m. at a home near Radcliffe Avenue and Washburn Way. The woman was treated at Sky Lakes for wounds to her left hand and arm. 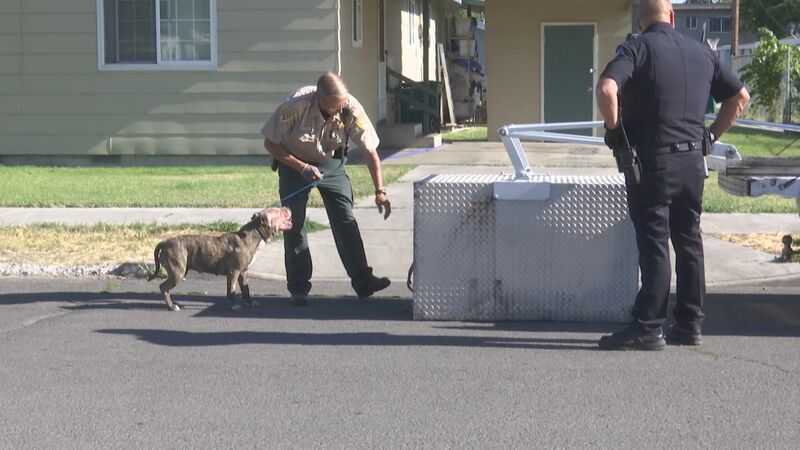 The PIT BULLS were taken by animal control officers, and will be held on a mandatory 10 day quarantine. The owner was arrested on an outstanding warrant. That case was the second dog attack of the day in southern Oregon. A Jackson County Sheriff’s Deputy shot and killed a pit bull in Central Point Tuesday morning after the dog attacked both him and a teenage boy. But I just saw on "The Dodo" that pit bulls are lovely! They can't stop smiling, and they love their human babies, and they steal ice cream, and they give their 20 puppies to their fur mommies to hold, and they're besties with a goat, and they are playful, friendly, loving, and harmless. Gosh, why do these nasty pit bulls have to burst my bubble? Are we sure it was a pit bull? Was the pit bull abused? Did the owner train it to fight? Was the pit bull properly socialized? I do think the pit bull looks adorable with blood all over its face. I mean, that pit bull does not look scary at all. I hope it doesn't get a dirt nap because I would have no problem bringing that cutie home. I would rehabilitate it with love, a pack mentality, special powers, a therapy dog vest, lots of opportunities to attack again, but because my love will be so strong, the pit bull will obey my lion taming skills.